Make yourself at home in one of the 364 air-conditioned rooms featuring minibars and flat-screen televisions. Complimentary wireless Internet access keeps you connected, and satellite programming is available for your entertainment. Bathrooms have complimentary toiletries and bidets. Conveniences include phones, as well as laptop-compatible safes and desks. Don't miss out on the many recreational opportunities, including a 24-hour health club, a sauna, and bicycles to rent. Additional amenities at this hotel include complimentary wireless Internet access, concierge services, and babysitting/childcare (surcharge). Getting to nearby attractions is a breeze with the area shuttle (surcharge). Enjoy international cuisine at Cafe Madrid, one of the hotel's 2 restaurants, or stay in and take advantage of the room service (during limited hours). Quench your thirst with your favorite drink at the bar/lounge. Buffet breakfasts are available daily from 6:30 AM to 10:30 AM for a fee. Featured amenities include limo/town car service, a computer station, and express check-in. Planning an event in Berlin? 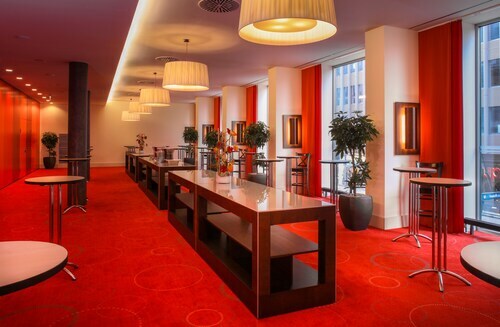 This hotel has 12917 square feet (1200 square meters) of space consisting of conference space and meeting rooms. A roundtrip airport shuttle is provided for a surcharge (available 24 hours), and self parking (subject to charges) is available onsite. Enjoy international cuisine at Cafe Madrid, one of the hotel's 2 restaurants, or stay in and take advantage of the room service (during limited hours). Quench your thirst with your favorite drink at the bar/lounge. Buffet breakfasts are available daily from 6:30 AM to 10:30 AM for a fee.Don't miss out on the many recreational opportunities, including a 24-hour health club, a sauna, and bicycles to rent. Additional amenities at this hotel include complimentary wireless Internet access, concierge services, and babysitting/childcare (surcharge). Getting to nearby attractions is a breeze with the area shuttle (surcharge).Pets allowed Check-in time starts at 3 PM Check-out time is noonFeatured amenities include limo/town car service, a computer station, and express check-in. 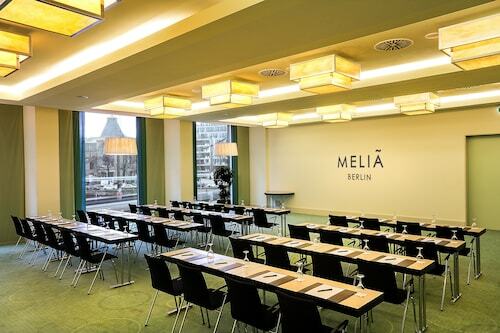 Planning an event in Berlin? 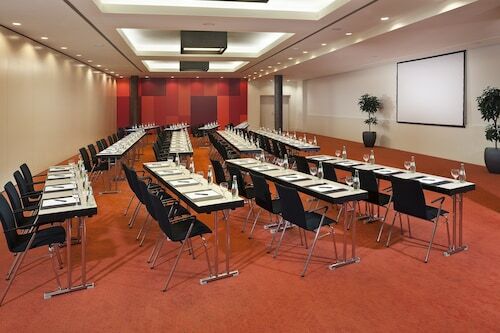 This hotel has 12917 square feet (1200 square meters) of space consisting of conference space and meeting rooms. A roundtrip airport shuttle is provided for a surcharge (available 24 hours), and self parking (subject to charges) is available onsite.Extra-person charges may apply and vary depending on property policy.